This past week, I noticed that a woman in the waiting room had a teenage son with Down Syndrome. When I later spoke with her, I told her about my 2 year old daughter with DS. Her eyes lit up, and we proceeded to speak in Spanish (very badly, on my part) about our kids. We had an instant kinship. A few days later, her husband came in and proudly showed us pictures of his son on his cell phone. He wanted to show me that his son could ride the T with his friends. He then showed me a video of his son dancing Latino style (very well, I must say), and we shared a "I-have-a-kid-with-DS-and-I'm-so-proud" moment. Later that afternoon, I met a man in his 60's who has DS. He came with a caretaker, and was in a wheelchair. He kept falling asleep while we were trying to talk to him. He was nonverbal and pretty out of it. While they were 2 very different individuals, the contrast was completely obvious to me, right there in front of my eyes. Growing up now with DS vs growing up before the 70's has huge implications for a child's future. I read an article written by a mom who was recently told by her doctor that her 6 month old kid could be a janitor or a grocery store bagger someday, but nothing more. She went on to say that these limited predictions of her child future are still very much widely believed, and listed some examples of other current issues that quite frankly shocked me (Click here to read the article to learn about a treatment for stunting disabled children's growth to be small so that their appearance will match their intellectual abilities, and also how a scholar was denied residency because his child had DS). I have to admit that I had these misconceptions about the future of a person with DS before Evie. Now that I know her, I know that while I would still be proud of her if she became a janitor or bagger, she could also become anything else she wants to be. 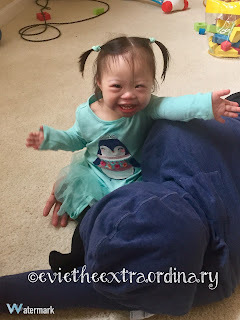 This is largely due to the fact that she has Early Intervention therapists 4-5 days a week, some of the best medical care in the world, governmental policies that provide for and protect kids with disabilities, loving family and friends who believe in and cheer for her, and our belief that God made Evie unique and gifted in ways that we cannot wait to discover. I am thankful to be surrounded by people who are willing to learn more about DS and about Evie herself. 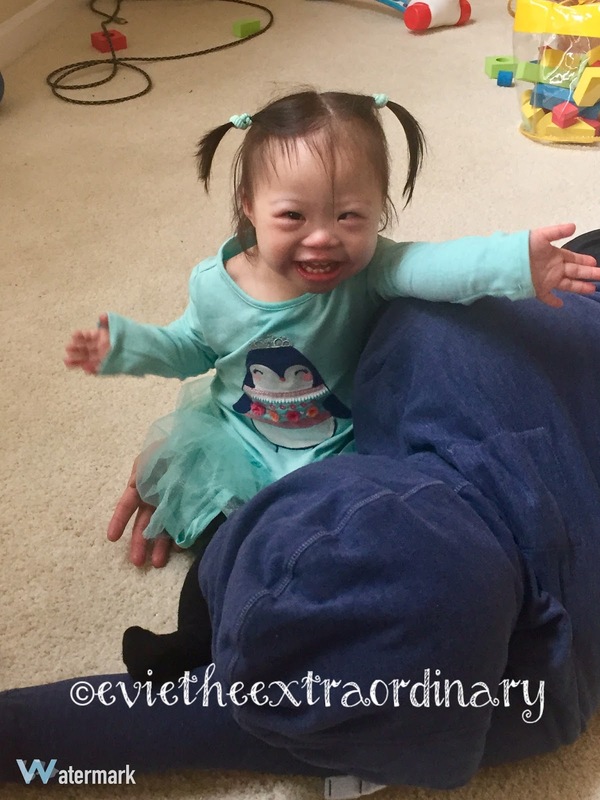 Right now, Evie loves music, dancing, and reading books. This puts her in a good place to become a rock star, librarian, scholar, musician, a Zumba instructor, or J.Lo's successor. I'd be proud of any of those (with more clothing though if she follows in J.Lo's footsteps)!